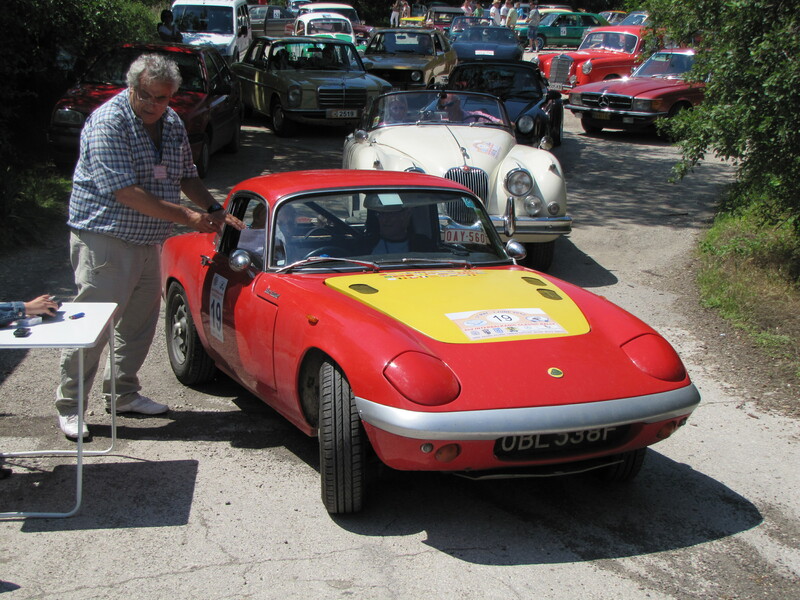 The 2nd Interbalkanic Classic Rally sounded too good to miss – so we signed up for it. It was to be based at Varna on the Bulgarian Black Sea and jointly organised by the Greeks and Bulgarians. Our route out was influenced by insurance, the Green Card only covered EU countries which ruled out Belgrade (Serbia) so we fixed on Calais, Aachen, Cologne, Frankfurt, Regensberg, Linz, Graz, Pechs (Hungary), Arad (Romania) and Rousse (Bulgaria). With detours this came to about 1900 miles – and 32 hours according to the internet routefinders. No-one had told the internet about Romania – as we were to find out. During the last rally we had problems with points, differential and starter motor so we now had a new starter and diff and had fitted a Boyer Bransden ignition system, still points based but with electronic wizardry to reduce the current passing through the points and hopefully extending their life. Whilst it had not been a problem we had for some while also suffered from a petrol leak in the Webbers so they had been refurbed and restored to their original, larger jets. Twelve miles fromhome the engine was missing so a plug change and a tweak of the carb balance and mixture seemed to improve the situation. Our run was smooth to Dover and on to the overnight stop in Liege where the hotel corridor had more bikes than residents. The next day was a long run to Graz but with no lorries on the road on a Sunday it was an easy one. On Monday we crossed into Hungary and headed for Pechs. It was a public holiday so no lorries and the roads, which curved and flowed gently though the countryside, were Lotus terrain and pleasurable driving. A problem emerged at a fuel stop when the boot handle gave up. It had long been stiff and the prospects of a shut boot which would not open or an open boot which would not shut were equally unappealing. We found a compromise and moved on. Pechs was a European City of Culture in 2008 and has a main square with pedestrian streets off – but the tourist information was closed, on a bank holiday! We were pointed towards a locked gate and managed to extract some tourist leaflets carefully positioned within reach of long arms. We found a hotel just off the square – very friendly staff but with that mid European speciality – an aura of faded glory. The underground car park looked welcoming as the heavens opened behind us and the meandering tourists scurried for shelter. The car park wasn’t such a good idea next morning as the car does not like steep inclines especially first thing in the morning. Furious revving and slipping of clutch helped us escape the fumes we left behind – sorry guys! Crossing southern Hungary on largely empty roads to the Romanian border near Arad we made good time but the rest of the day was pretty dire. It started with a 6 mile queue of lorries to enter Hungary all parked up on the verge of the single carriageway main road. Arad was busy and was being dug up – probably to improve the roads. It was hot and the first main holdup was a crash between a van and a lorry at a junction a few metres before a level crossing – which itself was taken slowly because the rails lifted as the lorries passed over. We stopped and crawled and stopped and the temperature rose to a good 99 degrees (why did the electric fan choose today to have a earthing fault?). We saw four accident sites that day and were only surprised there were not more. That poor country is blighted by the continuous thunder of heavy lorries, vans and cars all chasing time through country and village alike. The traffic moves in bursts as you overtake one group of lorries before catching up with the next batch a short way ahead. The underlying poverty both here and in Bulgaria is demonstrated by the “ladies of the road”, waiting in lay-bys for their next client. We reached Sibiu before dusk and enjoyed a brief but damp stroll round the 12th century town and a rest from the concentration of the road. Next morning we sorted out the fan and changed the points as the engine was clearly unhappy. The points were more burnt than I expected from the new ignition system – I later discovered that it was also not earthing properly and the engine was much happier when that was improved. The plan was to drive the trans Fagarasan mountain road south to Pitesti – but when we got there we found it was closed as the winter snow had not cleared. We tried to visit the Monastery of Cartisoara – but that had a sign saying it didn’t welcome tourists – despite the brown tourist sign. This was clearly going to be a good day! We returned to the main (lorry) highway and the motorway to Bucharest. An electrical check at a service station found the ignition earthing fault and the engine hummed as we approached the capital. Sadly the navigator didn’t recognise the importance of the signs meaning “ring road” so we ploughed on to the very centre at 5pm on a hot Tuesday. Fortunately fan and ignition worked perfectly as we asked our way out to the road south to Bulgaria – we asked at petrol stations, we asked pedestrians, we asked the drivers of the cars ahead of us, beside us and behind us – and it worked! The only one that didn’t was the taxi driver who demanded an extortionate 50 euros (reduced eventually to 20) to guide us out. Once we found the road we sailed down to the border, no formalities there of any sort, not even a passport check. Then on to the picturesque town of Velika Tarnova, arriving just before dusk. For a morning we were tourists before completing the final 140 miles to the rally hotel, driving through a flooded Varna as the heavens again opened and the streets turned to rivers. We were amongst the first to arrive and soon met the only other non-Balkan participants, a Belgian couple who live in Greece. The others were from Greece and Bulgaria with a few from Romania; this meant it was an international rally so all documentation was in English (with a Greek accent). The rally was unlike any other regularity rally we have ever attended. The start was at 9.30, much later that the 8.00 we are used to. We fluffed the first regularity as I had not read the instructions properly and was too busy directing the driver to realise in time that we’d gone wrong. We headed north to Kavarna, whose Mayor awarded us a prize for looking good and Allison was interviewed by the national TV for broadcast on the news reports that evening. The highlight of the day was lunch at the Thracian Hills Golf Club. We were joined by a Bulgarian crew and despite our complete lack of Bulgarian and their limited English we soon established that the local car club was very friendly with members from a wide background and a huge variety of cars. I don’t know how they’ve managed it but they have all sorts of classic and vintage cars, maybe because we were English we heard more about our cars. These guys regularly come to UK buying up cars – Bentley, Jaguar, a model T Ford. One ran a garage and had a second hand tow truck bought in England – for work not the rally. One Greek couple must have the last surviving Morris Marinas – not one or two but seven! (stones or petrified forest – opinions are divided) we provided entertainment for the residents of Denvya by chasing round cones. We should have excelled at this but the Elan has a deep rooted dislike of chicanes round bollards and stop-starts into “boxes” and stalled and would not start! It did this on the last rally in Spain so there’s something to sort out here – suggestions please! Lunch was at an old mill whose wheels were powered by water bubbling up from springs – a very tranquil and peaceful setting and our Bulgarian friends from yesterday were insistent we should join them again. The restart was particularly random, one moment we were wandering round the springs and the next there was a concerted rush to leave – and with the time control at the end of a country track this resulted in a long queue of cars going nowhere slowly! Day three and we headed south to a Russian owned beach resort and lunch. We returned to the hotel at about 4pm and as the cars had done little more than 200 miles in the three days there was little need to do much apart from clean off the dust. Prize Giving that evening was clearly the purpose of the rally. We were seated at long tables in our car clubs and this time we were with the Greeks. The meal started at 8.30 and after the appertisers was prize giving. Everyone received a prize – we didn’t intend to be greedy but we received five! One for winning our class, one for finishing the rally, one for the longest distance travelled to the rally, one for Lady Driver and the last for representing our participating club – Club England. Allison was also awarded honorary membership of the Automobile Retro Club Varna. Then there was dancing and singing and at about midnight the main course arrived – we didn’t last long enough for desert and left the Varna and Burgas clubs celebrating a successful and enjoyable event. 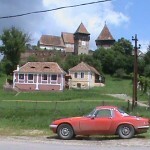 Our return journey mirrored the outward, with sightseeing in Bulgaria, Romania and Hungary and a haul Austria to Calais. 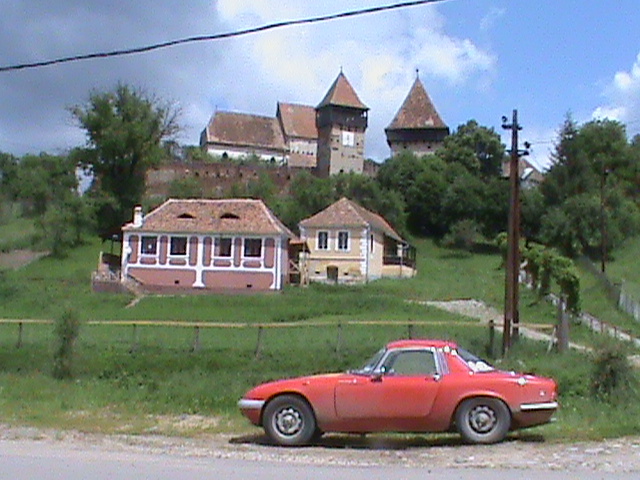 Romania in particular was a changed country once we got away from the main lorry route. This time we found the Bucharest ring road, which was slow and tedious (not really any better than ploughing through the centre though we had the advantage of knowing where we were going!). 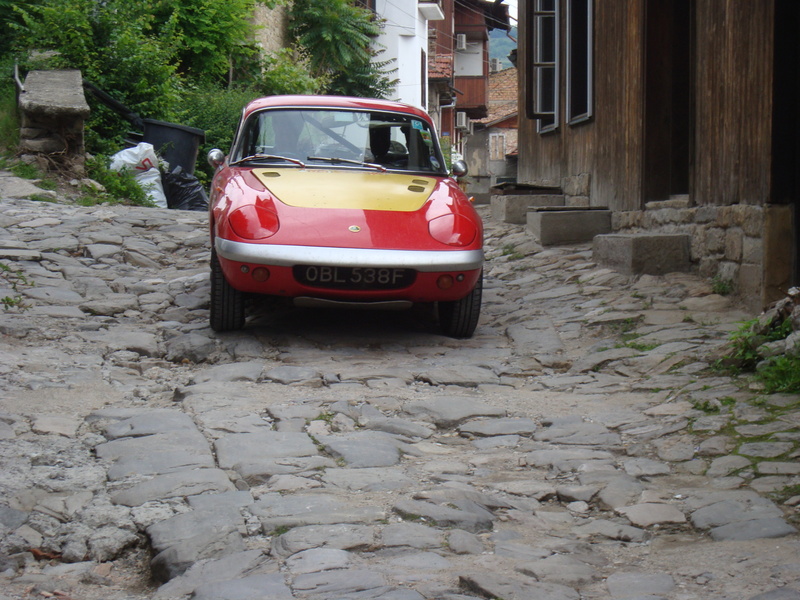 We visited fortified Saxon churches on deserted roads and tracks near Sighisoara and entered Hungary through the much more pleasant crossing at Oradea. Hungary’s motorways are top quality and we sped through to Tata where we spent the afternoon wandering round the lake, drinking coffee, eating cake and watching “dragon” boats rowing to the beat of the cox’s drum. We had one overnight stop before Calais, at Wuerzburg where the locals were drinking Franken wine in the sunshine on a bridge linking the main town with the Fortress Marienburg on the hill opposite. Then on to Calais and home. This was one of our easiest trips with the car taking the long hard slogs and the gentle meanders in its stride. There’s still something to sort out with the fuel consumption as we only managed 23 mpg and a very sooty rear end! Somehow that’s no surprise as there’s always something that needs doing……. Now in Sighisoara in Romania on the way home and its raining! 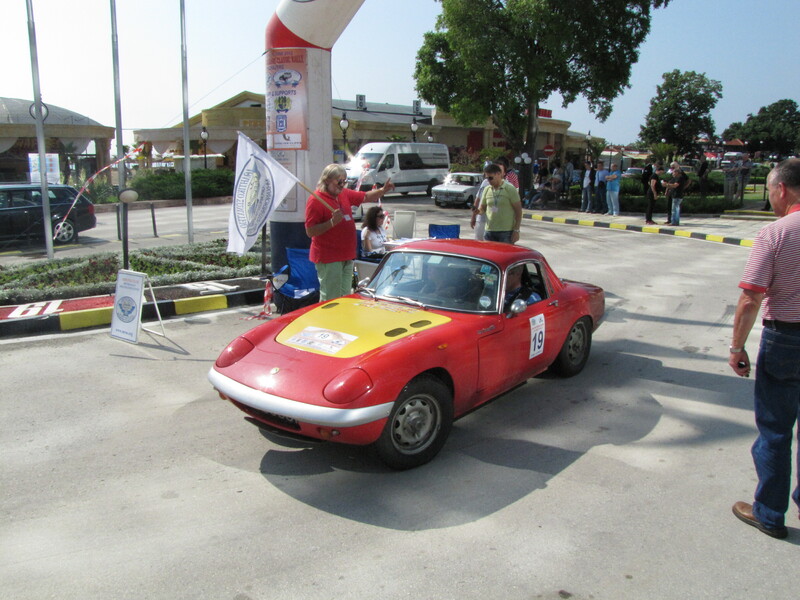 A contrast to the rally which was run in the heat and sunshine of the Bulgarian Black Sea Coast from a base in Varna. A rally unlike any other we have done – we ended up with 6 Trophies and Allison was given honorary membership of the Automobile Retro Club of Varna. Despite making a hash of two of the nine Regularity sections we won our class so got a trophy for that, a trophy for finishing, one as representatives of the “England car club”, one for travelling furthest to attend (1,900 miles each way), for Allison, Coupe des Dames and one from the Mayor of Kavarna. When the Press found out how far we’d come, Allison was interviewed for Bulgarian TV – and they broadcast the footage! The rally was more a party than a rally with the purist concepts of early starts and snatched lunches replaced by a more self service approach and two hour lunches. Our Bulgarian hosts were particularly welcoming and despite our complete lack of Bulgarian insisted that we join them for lunch, where we found their knowledge of English was better than many were prepared to admit. The participants included a pair from Romania, a Belgian couple and the remainder roughly equally split between Greeks and Bulgarians. The cars displayed the totally unexpected wealth of classic cars now restored in the Balkans – a mid 1950’s Bentley, and 1930’s Moskvitch, “modern cars” such as Golfs and Mercedes 190 – and extraordinarily to the English, a Morris Marina, one of 6 owned by the same couple. There were Porsche, Jaguar, Alpha Romeo, Beetles and BMW. How’s the Lotus after this travelling, with some pretty long days? Liege to Graz was the furthest in one day and Pechs (Hungary) to Sibiu (Romania) probably the hardest with hour after hour of following trucks on totally inadequate roads through villages and valleys, overtaking one goup just to come up to the next. We saw four accident scenes that day. Pretty well all things considered – we’ve had some earthing problems, the boot lock is broken and the air intake box is held on with bailer twine! This entry was posted on February 15, 2014, 8:50 pm and is filed under Patagonia Rally 2010. You can follow any responses to this entry through RSS 2.0. Both comments and pings are currently closed.